What can I send to Poland? What items are restricted? If you are moving to Poland to live there, either permanently or for a limited period, you will need to ship enough of your possessions to allow you to set up home – in which case Send My Bag can help by shipping your belongings to Poland in suitcases or boxes. This is particularly useful for international students in Poland who need to quickly set up home in their student accommodation. Send My Bag can also help ship your luggage to Poland if you are going there on holiday, to allow you to sail through your journey without having to think about dragging your baggage behind you. This is especially helpful if you need to bring sporting equipment, such as skis or golf clubs with you. You can save yourself a lot of stress and hassle by sending your luggage to Poland with Send My Bag, rather than dragging it behind you on your journey through airports and onto public transport. By sending your luggage, you can bring more with you than your airline baggage allowance would permit. Your possessions will be looked after for you, allowing you to get on with exploring your new surroundings or enjoying some outdoor pursuits. To learn more about sending luggage to Poland, visit our ‘How it works’ page, or our ‘FAQs’. Although not a traditional golfing holiday destination, Poland has plenty to offer keen golfers. There are around 25 courses to choose from, including Modry Las, Sand Valley and Postolowo. You can play golf using your own golf clubs by sending them to Poland with Send My Bag. This means you will avoid any oversized baggage fees from your airline, and it will be much easier to travel to Poland without dragging large golf bags behind you. Find out how best to package your golf clubs by visiting Send My Bag's golf clubs shipping page. There is plenty of pretty countryside for cyclists to enjoy in Poland. This, together with good road conditions, makes Poland a good destination for cycling holidays. You can send your own bicycle to Poland with Send My Bag and enjoy cycling through Poland's beautiful landscape. Check out our bike shipping page to find out how to send your bike, including how to package it appropriately. If you send your bike you will avoid oversized baggage fees and won't have the stress of carrying the bike to and from the airport. If you are moving to Poland permanently, international removals to Poland is something you will have to think about, in order to transport all of your possessions. If you go for this option, ensure that all your items are carefully packaged using suitable packaging materials so that they won’t get damaged in transit. If you are an international student wishing to study at one of Poland’s universities, such as the University of Warsaw or Jagiellonian University, there is no need to worry about getting all your belongings to Poland. You can just send your possessions to Poland, to your student accommodation, with Send My Bag. Find out more about student shipping on our student removals page. You can also send a parcel to Poland with Send My Bag. Friends or family members can send you mementos from home in a parcel, or you can send them gifts from Poland, including birthday and Christmas presents. Just make sure you choose a good sturdy box when sending a parcel to Poland and tape it up well to ensure safe transit. Also read up on rules regarding personal effects and brand new items (see below). Take a look at our information page on parcel shipping to find out what you can send with Send My Bag and how to package your items. If you have large items ? like an ottoman or a nest of tables ? that you need to send to Poland, you could go for air freight. You should normally allow one or two days for items to be flown to Poland. The service is quite speedy, but it can be quite expensive, especially as you will likely have to pay for a customs agent to sort customs clearance for you. An additional cost to consider is getting your items to and from the airport, which means the price of using air freight could quickly mount up. If you send internationally by air freight to Poland your items will arrive at one of the major airports, such as Warsaw, Krakow or Gdansk Airports. Rather than choosing air freight, you could go for sea freight or container shipping to transport your possessions, such as a snooker table or a canoe, to Poland. This is a good option if you don’t need to receive your items immediately. It can be less expensive than air freight, but you will still need to use the services of a customs agent and will need to sort out how to get your items to and from the ports. So, the cost could be more than expected. When using container shipping to Poland your items will most likely arrive by ship at one of the major sea ports, such as Gdansk or Gdynia. It was a great service, I will keep using it and recommend to my friends. No complaints. Great service. Wonderful value. If the consignee is a Polish citizen or permanent resident, their TAX ID (PESEL) or copy of their Polish ID Card (Dowód osobisty) will need to provided, along with a copy of their passport and flight ticket showing entry into Poland. If the consignee is not a Polish citizen or resident, a copy of their passport and proof of entry into Poland, such as their flight ticket is required. Consignees will need to provide a written statement to Polish customs detailing what their Personal Effects are for and why they are being shipped to Poland. This written statement can be automatically downloaded from your Send My Bag account based on the reason selected for shipping. If the consignee is shipping to Poland for study they may be required to provide their enrolment or placement letter for customs clearance. Duty relief is only granted to shipments considered as permanent imports for one year or more such as for relocation or study, were the relevant evidence is also provided. Polish customs law does not consider temporary imports such as for a vacation/holiday or business trip, or imports from returning residents who have been outside of Poland for less than one year, as tax exempt unless the declared value is less than 45€ /$45 USD / £35 GBP. Should this value be exceeded, any duty and taxes will need to be paid by the receiver and are not covered by Send My Bag. 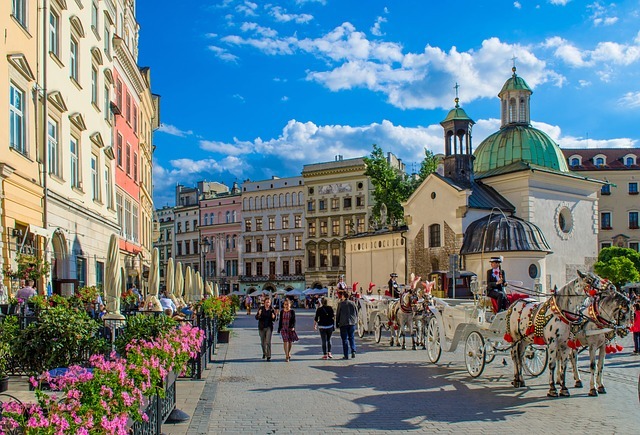 If shipping to Poland for relocation, customs may request evidence of living outside of Poland for more than one year such as a copy of an employment contract, lease or rental agreement and evidence of your new address in Poland. In order to claim duty exemption in these circumstances the owner of the goods must have already arrived in Poland and be in the country at the time of clearance. Shipment that require customs inspection will also incur an additional fee of 170PLN to be paid prior to delivery of the goods, directly to the delivering courier. The majority of Send My Bag shipments are not intercepted by customs since most countries offer a generous duty free allowance for personal effects. Personal effects are used items that the sender has owned for at least 6 months. If Polish customs stop your shipment and find brand new or commercial items, your shipment may be assessed for customs duties and taxes. Please keep this in mind when sending gifts to Poland and check with Polish customs so you are aware of potential customs duties you may have to pay. Customs processes and allowances do vary by country and, therefore, we advise all travellers to take 5 minutes to check how their personal circumstances and what they are sending will be viewed in accordance with prevailing Polish customs regulations. To show that your shipment consists of personal effects, you will be required to complete a brief non-generic packing list online, entries to be made in the format: "2 x Woollen Jumper, 3 x Pairs of Leather Shoes, 3 x Woollen Scarf, 2 x Woollen Hat", and so on, rather than as "10 x Used Clothing". When a bag is stopped by customs for any reason (missing documentation, prohibited contents, commercial contents or further information required) Send My Bag™ records how long customs hold it for. Our historical statistics for this route indicate that if the customs authority stops your bag they will on average take 8 days to process it and release it back to us for delivery. Poland’s capital city is Warsaw, located towards the east of the country. It is a large city with over 2 million inhabitants. Visitor attractions in Warsaw include the Market Square, Lazienki – the Royal Residence Park, and the Warsaw Uprising Museum. Other Polish cities well worth a visit include Krakow and Gdansk with their beautiful Old Towns. Day trips can be taken in Poland around the fascinating Wieliczka Salt Mine, to the Auschwitz-Birkenau State Museum and to Malbork Castle. If you are into outdoor activities, Poland offers good hiking and horse-riding in the Tatra Mountains and in the many national parks around the country. Water sports can be enjoyed on the north coast and skiing in the mountains in the south, between November and February.